Your Spirit Guides are waiting to talk to you! Before you choose to experience this physical dimension that we call Earth, your higher self meets with Spirit Guides to design a blueprint that will enable your soul to learn and evolve throughout the course of your existence. And this extraordinary card deck by world-renowned spiritual medium James Van Praagh will assist you in tuning in to your Guides—spiritual teachers who give you guidance, knowledge, or wisdom. Each of these 44 beautifully illustrated cards serves as a cue that prompts you toward your ideal goal—your own personal journey of self-awareness. 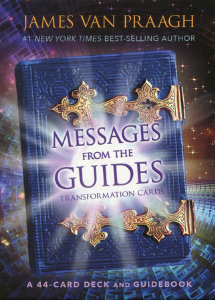 The enclosed guidebook will bring further insight to each card’s uplifting message, such as Be Yourself, Live Your Bliss, You Are Never Alone, and more! Through these channeled messages, you will learn to develop a higher understanding of Spirit and remember that you are never truly alone.